BA21 web + media is a design and development firm located in Charlottesville, Virginia. Kardinal Hall is a brand new restaurant, bar, and event venue located downtown Charlottesville. It lives in the fully renovated historic Coca-Cola bottling plant and features outdoor bocce and European-inspired fair. The site features a food menu, full beer list, 'buzz' blog and signup form for large event rentals & in-house catering. To keep people up-to-date, the site publishes social media updates from Instagram and Twitter, and includes regular blog posts (which then go out to Facebook). 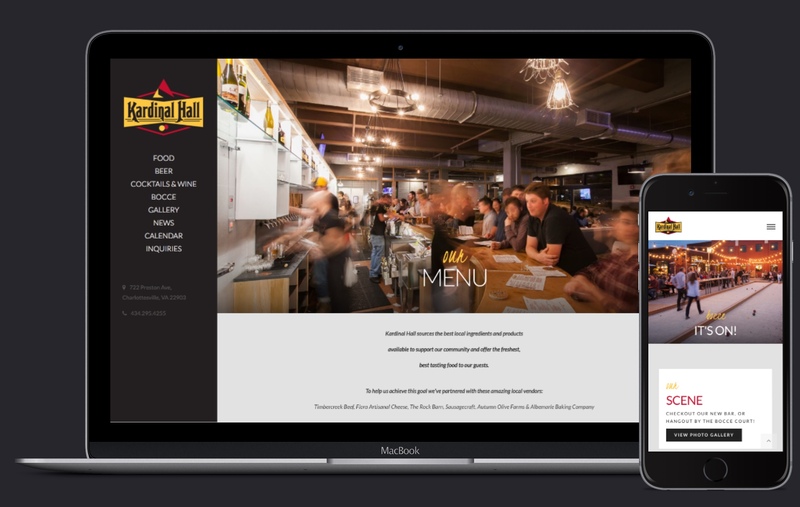 The food menu and beer & wine list is updated regularly by Kardinal Hall using Wordpress. To add a food menu item, they simply choose a category, add a description and price, and click save. It's that easy.